I hope everyone enjoyed the holiday weekend. We sure made the most it. Last week's free time was spent making these two guys. The last two I made for a shop here locally sold really fast so she requested a couple more. The owls have quite of a reputation at the shop. The person I sell them to always lets me know where they go to live. It is fun. I snuck away on Friday afternoon for some thrifting at Goodwill. I lucked out and found a bunch of different fabric. I usually find sheets or pillowcases. Rarely do I find fabric. I felt like I had hit the jackpot. I found the blue fabric below and thought it would be perfect for the Fourth of July. I already had the red polka dot fabric from Christmas. I had planned on making a shirt, but Harper requested a skirt. It worked out better because I was short on time. The skirt was easy to throw together. Don't you just love the natural pose? I have a couple of birthday presents to make. Hopefully I will get around to those this week so I will have something new and different to show next week. I can imagine that those cute owls go over pretty well. That's great that you have a local store to sell them to. Love Harper's skirt, too. 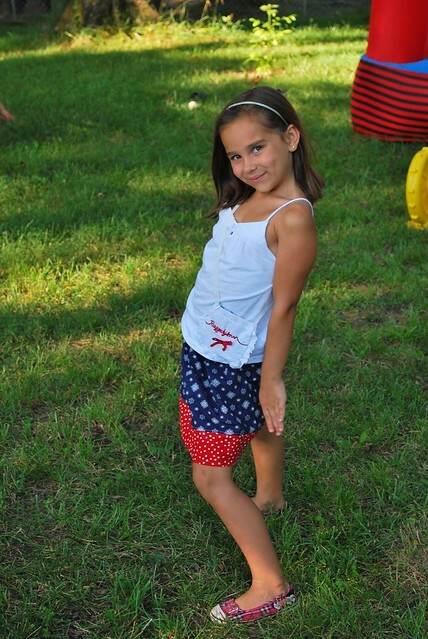 Great 4th outfit! Don't you love it when you find fabric?? That is a nice surprise indeed. I love the skirt, love the pose, but your owls...sigh. As always they are the cutest things ever! I think that is so cool about the owls, they are really-really cute! Aw, yes...."natural" poses are right up there with "natural" smiles! Yay for good thrift store finds! Your owls always make me smile...and your daughters pose is cute. tee hee...we've been getting a few of those over here as well. 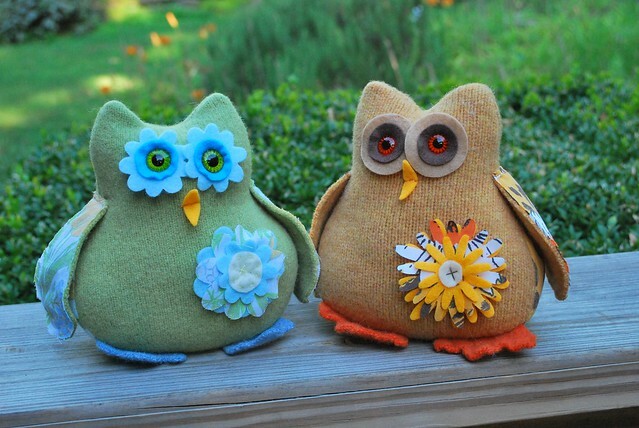 Your owls are so unique considering there are so many stuffed owls out there right now. Yours really are special!